What do you know about the historic camps along the Uwharrie Trail? One of these camps was recently re-discovered in the Birkhead Mountains Wilderness. Who built these camps? What makes them different from any other campsite along the trail? 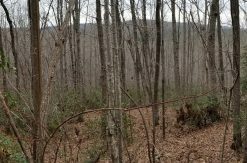 When Scoutmaster Joe Moffitt led Boy Scouts to create the Uwharrie Trail in the 1970's, he also had them establish a series of camps along the route. Most of these camps are located at the end of short side-trails. At some camps, the Scouts built a small rock fireplace and chimney, similar to a backyard barbeque. These fireplaces had a metal grate, like a grill, to hold cooking pots over the coals. The short chimney helped direct some of the campfire smoke up into the air instead of letting it go directly into campers' eyes and clothes and hair. If you've ever come home from a camping trip smelling like you slept in the fire pit, you know what I'm talking about! The Scouts put in the extra effort to set the chimney rocks in mortar. They didn't just stack up a bunch of rocks. 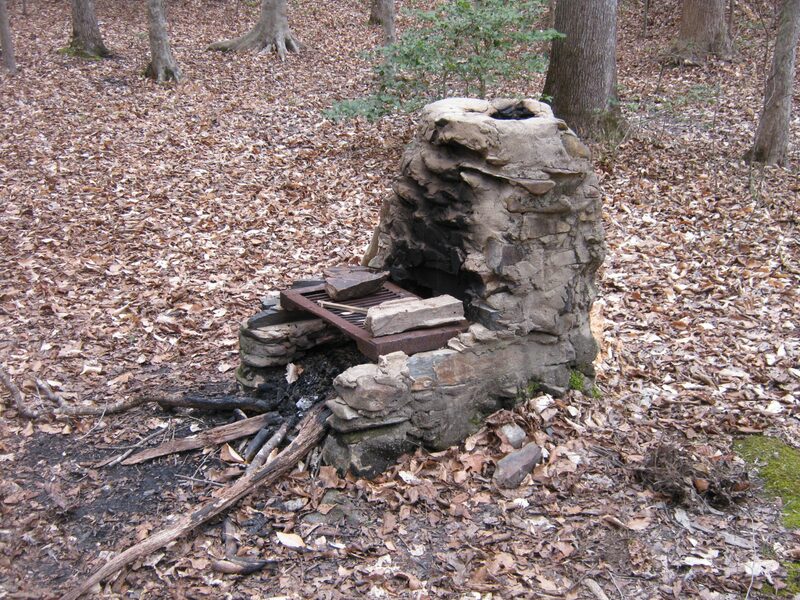 At some camps, the Scouts built a permanent fire ring by mortaring stones together. The punched-letter aluminum signs that Joe Moffitt made are a well-known part of his legacy. Joe hand-stamped information letter by letter into thick aluminum sheets. 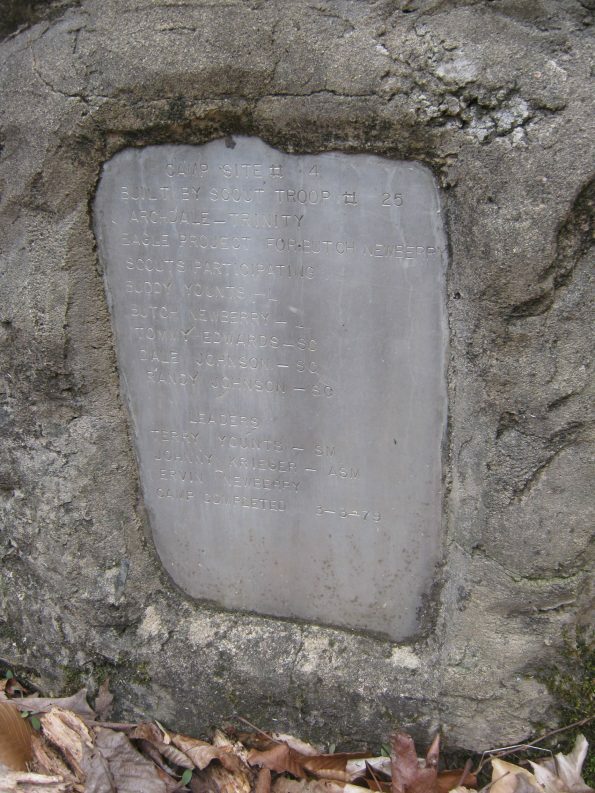 The signs list the Scouts who helped build each camp and when the camp was established. I've often heard the story that Joe worked for GE in Asheboro where they made toaster ovens. The aluminum sheets were what they stamped out to make the crumb trays. I suspect the aluminum blanks that ended up along the trail are out-living those that ended up in somebody's kitchen! Some of these camp signs were set in mortar on the side of the camp chimney or fire ring. At a few camps, the Scouts simply nailed the sign to a nearby tree. Joe labeled the camps numerically - Camp 1, Camp 2, Camp 3, etc. At some point, he saw the need to label some camps by adding a letter, such as Camp 8B. 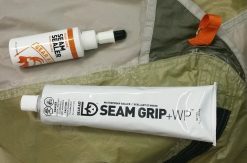 Mike Chisholm, one of Joe's former Scouts and a founding member of the Uwharrie Trail Club, thinks Joe's time in the military had something to do with this preference for simple, numeric labeling. There is at least one exception. Joe also named Camp 7 the 'Twin Springs Camp'. Yes, there are two springs near that camp. 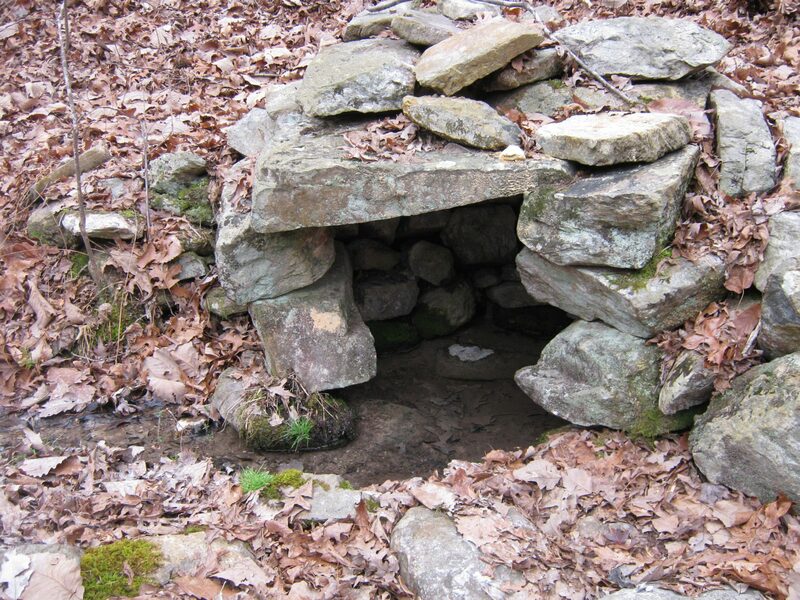 Where possible, the Scouts would clean out a nearby spring (or two) and build a stacked-rock spring box to protect the water source. The information we have about the camps is far from complete. The Uwharrie Lakes Region Trail Guide includes notes about the location of the known camps and the text from their signs in an effort to help keep the information from being lost forever. 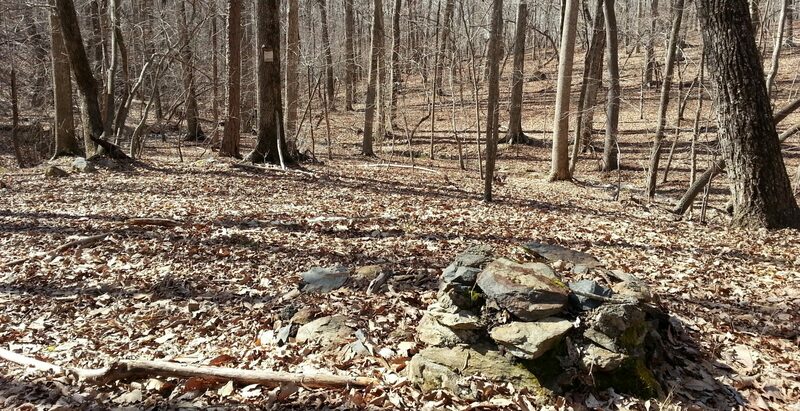 The gaps in what we know about the camps leave us with several 'lost Uwharrie' unsolved mysteries. The most obvious mystery is the number of camps. Including the camp discovered recently, I know the locations of Camps 1 through 7, 8B, and an unnumbered one near the southern edge of the Birkhead Mountains Wilderness. But are there more camps? 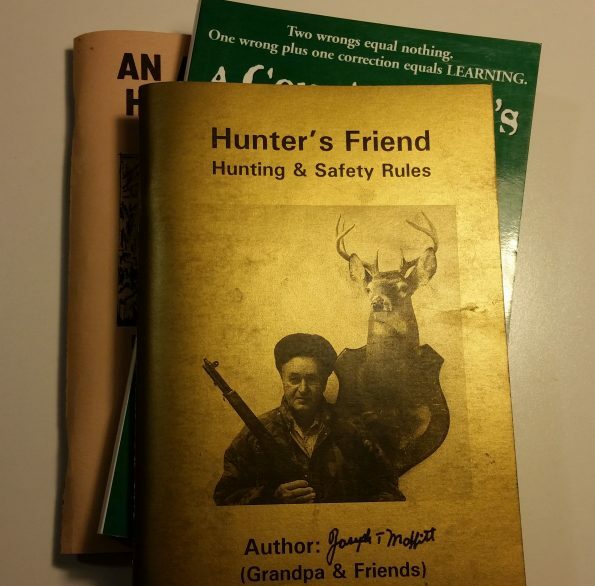 As I was writing this post and thinking about the missing pieces of this puzzle, something prompted me to turn around and grab one of Joe Moffitt's books off the shelf behind my desk. In particular, I picked up his third book, published in 2009 and titled Hunter's Friend: Hunting and Safety Rules. The title doesn't suggest this book would offer much information about the Uwharrie Trail or the camps. That's the main reason I have not read it yet, despite buying it more than four years ago at the Eldorado Outpost. But something made me skim through the first handful of pages now. In those pages, Joe included the text from an article written about him by Lorie Trotter for the Denton newspaper. Based on the description of his age in the article, I believe she wrote it around 2004. This sentence in the article nearly jumped off the page at me: "Together, they built 28 campsites, dedicating each one with a small plaque for later generations to see." Whoa! Was this Joe pulling his own Fred T. Morgan ghost tale and reaching out to give me an answer I was looking for?! If so, thanks Joe! There might have been a few hairs standing up on the back of my neck for a minute or two. Most of the known camp locations are spaced just a few miles apart. 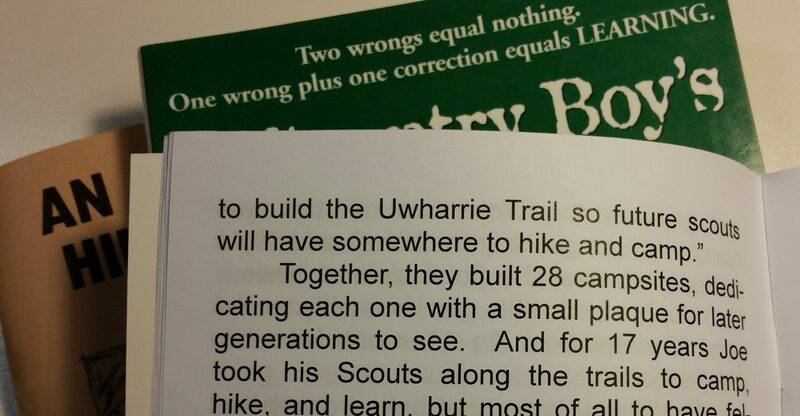 Given the 40-50 mile length of the original Uwharrie Trail route, there could easily have been 28 different camp locations. Were all 28 camps actually built on the ground? Or did some of them never make it past the planning phase? It is possible the reporter got her number wrong. Joe's book publisher may have made a typo. Either way, this is one 'lost Uwharrie' mystery worth digging into further. More camps could be waiting to be re-discovered! 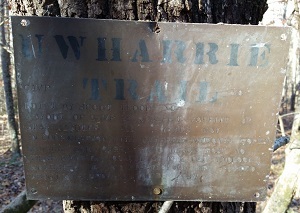 Do you have any interesting stories to share about the historic Uwharrie Trail camps? If so, please leave a comment below!